After installing the plug ins and it's dependencys you will find a new wizard at the new/other action. Next will pop up the standard wizard for creating a Diagram. After creating the model files, you can edit your call flow by creating the elements in the diagram, just use the palette. 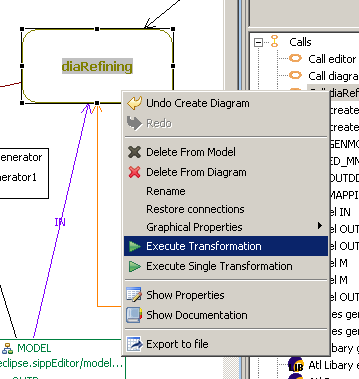 To execute the transformation/s you use the context menu available for a call. You can execute only the single call, or all calls linked together via the nextCall feature. From here this is a normal GMF based diagram editor. From the outline you can add or remove or rename diagrams displaying the elements from the model file. You can populate the diagrams by dragging the elements in the editor. You could also import your old atl launch configs when you save it to a file (in the common Tab shared file). Select the file in the navigator, and select "call chain ->createfromLauchConfig"
This creates a new callchain file named after the lauchconfiguration. 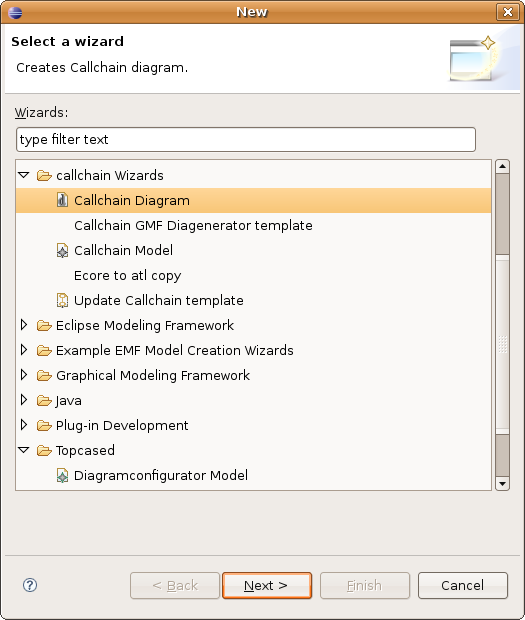 You can select this callchain file and select new CallChainDiagram just like above described.